Dog toys, plush dog toys & dog balls for Boston Terrier dogs from Boston Terrier Gifts. Boston Terrier Playtime! What a fun time to play with Boston Terrier Toys! Choose some chew dog toys or plush dog toys, balls, to keep your Boston Terrier active and happy. 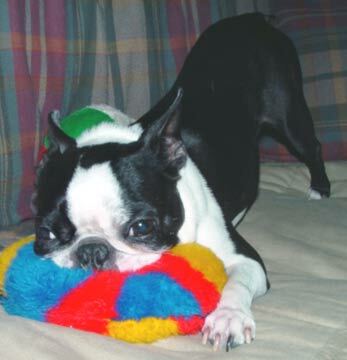 Playing with dog toys gives your Boston Terrier exercise and fulfills their need to run and play. Dog toys provide hours of fun in the most productive way possible. Find your dog's favorite kind of toy such as dog bones or dog balls as well as some that will improve doggie dental hygine or help in dog training. Choose from several types of dog toys to make your Boston Terrier a content and healthy dog. Dogs love chasing and squeaking the Plush Mega Squeaker Mat Disc Dog Toy! 16 Loud Squeakers - one in every square. Mega Squeak will keep your Dog entertained. Skinneeez Stuffingless Dog Toys Bring out your dog's natural hunting instinct. Realistic looking animals. Dogs will enjoy hours of entertainment flip-flopping these stuffing-free Skinneeez. All Skinneeez toys have 2 squeakers - one in the head and one in the tail for double the fun.Unique dog toys have no stuffing for your dog to pull out! Enjoy less mess around the house with these super soft, flat friends. Extra-long, extra-floppy body is easy to grab, hold, and carry by almost any sized dog. Plush toys measure about 14" long! Include squeakers in head and tail. Machine washable. Zanies® Minty Ropes are soft braids of rope are infused with mint to give dogs a delectable chewing experience and fresh breath. Chewing rope helps dogs clean their teeth. Mint scent encourages dogs to continue chewing. They are vacuum-sealed package locks in freshness.